Reading through all of this information may be confusing; feel free to reach out to us directly at 818-279-6580 to speak to an intake coordinator who will take down your concerns and have one of our care coordinators call you back to talk about your options. Call us to get an explanation of the many types of care that are available, quotes and even assistance with learning about programs that help you pay for the care you need. We specialize in working with seniors who are over 65 years old, have a care need and have a limited budget. The Assisted Living Federation of America defines assisted living as a long-term care option that combines housing, support services and health care, as needed. 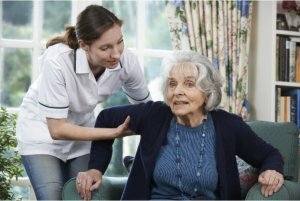 Assisted living is designed for individuals who require assistance with everyday activities such as meals, medication management or assistance, bathing, dressing and transportation. Some residents may have memory disorders including Alzheimer’s, or they may need help with mobility, incontinence or other challenges. Residents are assessed upon move in, or any time there is a change in condition. The assessment is used to develop an Individualized Service Plan. Assisted living is a residential alternative to nursing home care. According to the National Survey of Residential Care Facilities, there are over 31,000 assisted living communities nationwide serving almost one million seniors. A relatively new concept 25 years ago, today’s assisted living is the most preferred and fastest growing long-term care option for seniors. Based on the varied preferences and needs of the elderly, there are a variety of settings from which to choose. These choices range from high-rise buildings to one-story Victorian mansions to large multi-acre campuses. More than half of all residents are age 85 or older, and nearly 40 percent of residents require assistance with three or more activities of daily living. The median stay in assisted living is 22 months, and an overwhelming majority of residents are female. The philosophy of assisted living is to provide personalized, resident centered care in order to meet individual preferences and needs. Assisted living treats all residents with dignity, provides privacy and encourages independence and freedom of choice. Residents’ family members and friends are encouraged to get involved in the assisted living community. Encourage your loved ones to learn about the care provider philosophy. The most progressive state regulations take cues from consumers and focus on protecting consumers in a way that provides the most choice and independence possible. ALFA supports certain principles and public policy positions that should be included in every state’s assisted living legislative and regulatory framework. Assisted living communities provide more personal care services than an independent living retirement community. They offer a less-expensive, residential approach to delivering many of the same services available in skilled nursing, either by employing personal care staff or contracting with home health agencies and other outside professionals. Learn more about assisted living services and amenities. Assisted living costs vary with the residence, apartment size, and types of services needed. The basic rate may cover all services or there may be additional charges for special services. Most assisted living residences charge on a month-to-month lease arrangement, but a few require long-term arrangements. Assisted living is often less expensive than home health or nursing home care in the same geographic area. According to the National Investment Center Investment Guide 2010, the median rate for a monthly rental rate in an assisted living community is $3,326 per month. In comparison, the NIC Investment Guide 2010 also indicates the median rate of Nursing Care at $7,001 per month. The median is the midpoint, which means half of the residences participating in the research have lower fees and half have higher fees. The rental rate includes the base rent and service fees charged by the assisted living community. While 86.2% of assisted living residents today pay for long-term care from their personal financial resources, 41 states offer “home and community-based waivers” that allow low-income residents to live in assisted living. More seniors are purchasing long-term care insurance to help plan for and finance their long-term care needs. Learn more about financial assistance for assisted living care, and how to assess the costs. Assisted living is regulated in all 50 states. State regulations generally address the mandatory services a senior living residence must provide. All settings offer 24-hour care and supervision for those who need assistance. Care is provided with dignity and respect. Finding a Senior Living Community That’s Right for You! Before you start your search for senior living options, ask yourself key questions about what you are looking for, what you need to know, what your ideal outcome would be a year after move-in, how you will cover the cost of living in a senior living community, and how you will make the distinction between price and value!? Follow this guide to find the community that’s right for you. Please call 818-279-6580 to learn more about AMAZING resources!